Desarrollado en octubre de 1940. El diseño presentado por la planta 174 fue enviado para su consideración. Tras las exitosas pruebas entre febrero y marzo de 1941 el vehículo entró en servicio. With its extreme maneuverability and reasonably good gun, the T-50 has switched roles from a lightning-fast scout that can turn the tide of a battle into one of the most versatile flankers at Tier IV. Its previously infamous turning has been buffed to even higher levels. However, it is much slower and accelerates sluggishly, similar to the AMX 12t. The end result is a DPM flanker, much like the M4A3E8 Sherman. Since the introduction of Patch 8.7, the 440HP and 500HP engines have been removed, considerably slowing down this tank. In fact, this tank now suffers from being unable to attain its top speed easily, being nearly as slow as the infamous AMX 12t. However, not all hope is lost. The originally ridiculous traverse speed of the T-50 has been buffed even FURTHER, making it extremely maneuverable, and terrain resistance has been reduced, helping it attain its former glory. The 57mm ZiS-8 gun has been removed, replaced by the 45mm VT-43, a much better version of the VT-42 with enhanced accuracy, reduced aimtime and an even higher constant rate of fire that exceeds most automatic loaders. With that said, the T-50 now receives better matchmaking, now no longer meeting tier IX enemies. These changes radically alter the playstyle of the T-50. The T-50 used to be a high-speed, quick-turning active scout that accelerated faster than even the legendary T-50-2 and BT-2. It is no longer the case. The T-50 plays very similarly to the Covenanter except accelerating slower and having a superior gun. Use the T-50 like a support medium. Due to the accuracy of your gun, snipe in the early game, picking off suicide scouts and lightly armored medium tanks and scouts. Track enemies with your insane rate of fire to gain tracking bonuses, but do not get into the thick of the battle due to your low hitpoint pool. As the battle progresses and enemy numbers dwindle, find a lone enemy heavy tank and attack it by circling it. You should have no problem circling him, as the M4A3E8 Sherman has even lower speed than you and is considered one of the best circling tanks available. You could also hunt artillery by taking advantage of distracted enemies. Your "piddly" gun will make sure that you are not prioritized by heavier enemies with larger guns, allowing you to take advantage of their concentration and penetrate through enemy lines. Once finding an artillery piece, destroy it with impunity. However, do NOT sit in front of the SPG and plink away at its armor. Your armor is thin, and no amount of sloping can help you against 155mm caliber high-explosive shells, which will consistently one-shot your tank even with splash damage. The new changes to the T-50 force a change of playstyles, which is not entirely a bad thing. Persevere with the new T-50, and you might enjoy the new playstyle that gives it an arguably higher value in battles than before. The 45mm VT-42 cannon and 37mm Automatic SH-37 carries over from the T-46. It cannot be installed without suspension upgrades. Research the suspension to increase the already crazy traverse speed and to allow mounting of more advanced modules. Unlock the 45mm VT-43 to improve your aimtime, rate of fire and damage even further. Research the KRSTB radio set to allow you to receive enemy positions from much more distant locations. The T-50 light infantry tank was built by the Soviet Union at the beginning of World War II. The design for this vehicle had some advanced features, but was complicated and expensive, and only a short production run of 69 tanks was completed. Furthermore, even before it was ready for mass production wartime experience invalidated the underlying concept of light tanks. The T-50 was an advanced design for its time, with torsion-bar suspension, diesel engine (in common with all the new Soviet tanks) and well-sloped, all-welded armor. An excellent feature was the three-man turret with commander's cupola, which would not appear on other Soviet tanks until 1942. Most Soviet tanks of the 1939-43 era had either one-man or two-man turrets, which are far less efficient in combat than three-man turrets. Additionally, all T-50s had radios, a feature only found on the commander's vehicle in earlier models. However, the T-50 had several weaknesses; to begin with, like many Soviet tanks, it was very cramped inside. The main problems, however, were related to the new V-4 engine developed specifically for this tank, unlike other Soviet light AFVs, which used standard truck engines. The T-60 and T-70 light tanks and the SU-76 self-propelled gun used standard GAZ truck engines. Specialized tank engines, more expensive to produce, were reserved for higher-performance AFVs. The very mobile BT-8 fast tank, the T-34 medium tank, KV-1, the IS-2 heavy tanks, and their derivatives all used variants of the same standard 12-cylinder model V-2 diesel engine. The V-4 engine was extremely unreliable, and the design flaws could not be worked out. The engine's low reliability and high cost contributed to the demise of the T-50. The T-50 was a light tank developed on the eve of World War II for the Red Army. The experience of the Spanish Civil War led to an effort to upgrade or replace the large Soviet tank fleet. Prior to 1939, most tanks in Red Army service were improved versions of foreign designs. For example, the most numerous tank, the T-26 light infantry tank, was a copy of the British Vickers 6-Ton tank with a Soviet-designed turret and 45 mm gun. However, just prior to and during the war, the USSR developed new light, medium and heavy tanks of wholly indigenous design. 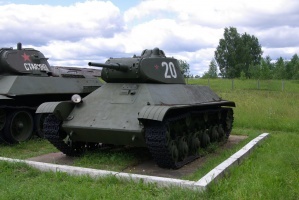 The T-50 light tank was intended to replace the T-26 infantry tank; in prewar planning, the T-50 was intended to become the most numerous Soviet tank, operating alongside the BT fast tank. Development of the T-50 started as the SP project (Soprovzhdeniya Pekhoty, ‘Infantry Support’) in 1939 at the OKMO design bureau in the S.M. Kirov Factory Number 185 in Leningrad, under the direction of S. Ginzburg and L. Troyanov. Initial prototypes, called T-126 and T-127, were not much improved over the T-46-5 project which had been abandoned earlier that year, but the heavier T-126 was selected for further development. The design bureau was gutted during the Great Purge, and was unable to continue the project, so it was transferred to the K.E. Voroshilov Factory Number 174 in May 1940. Troyanov completed the T-50 design in January 1941 and production was authorized, but due to technical problems, it was unable to proceed. In the meantime, a replacement for the BT fast tanks was developed and built at the KhPZ factory in Ukraine, which exceeded its original programme. The result was the very capable and economical T-34 medium tank. After the German invasion, Operation Barbarossa in June, tank factories were ordered to be transferred to the Urals. Part of OKMO was moved to Omsk after September, and production was finally begun. The T-50 was of an excellent design, but still suffered from technical problems, and at that time was found to be as expensive to produce as the more capable T-34. Much simpler T-60 light tanks were already being mass-produced. A total of 69 T-50 tanks were built (only 48 of them armed), before production ended in January 1942.Some further infantry tank design work on a prototype, called the T-45, continued at Factory Number 174 and the Kirovskiy Factory Number 100. But faced with the need to accelerate T-34 production, and due to a lack of interest from troops in the field, the Soviet infantry tank concept was abandoned. The few T-50s available were deployed on the Leningrad front. Few in-service photos survived and not much is known of their combat record. One uparmored T-50 was captured by Finnish forces and was used by them in 1944. This unit survived the war and is now on display in Finland.On paper, the T-50 should have been easily able to hold its own against any early-war German tank, however, paper specifications cannot always predict real-world performance. 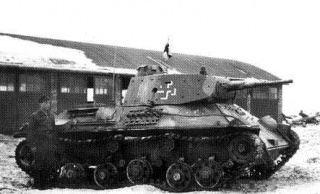 Most light tank production in 1941–43 consisted of the less advanced but simpler T-60 and T-70 light tanks. By 1943, the infantry tank role was considered obsolete, and cheaper SU-76 self-propelled guns took over the light infantry support role. Light tanks in tank regiments were being replaced by T-34 medium tanks. The liaison and reconnaissance roles of light tanks were assumed by cheaper armoured cars and Lend-Leasesupplies of Canadian and British Valentine tanks and U.S. M3 Stuart light tanks. There were two variants; a basic model and an up-armored model. 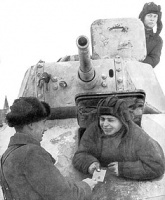 Just prior to the German invasion of the USSR, many Soviet tanks had their armor reinforced with welded or bolted add-on plates. Some Kliment Voroshilov heavy tanks, T-28 medium tanks and T-26 light tanks received add-on armor fittings. A few T-50s also received these add-ons. This up-armored variant is recognizable by the bolt heads that hold the armor added to the turret sides and hull front. The normal T-50 is a very 'clean' looking vehicle by comparison. Ironically, the armor add-ons were in response to erroneous reports of powerful German antitank and tank guns. 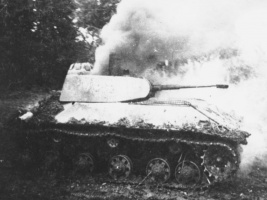 The uparmored T-50 had 57 mm of armor at its thickest points. Today, at least two T-50s survive. 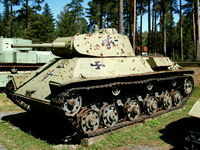 One is at the Finnish tank museum at Parola. This is a later model with bolted-on appliqué armour. A standard T-50 is on display at the Kubinka armor collection outside Moscow. T-50 Light Tank at battlefield.ru. Esta página fue modificada por última vez el 25 oct 2016, a las 10:43.